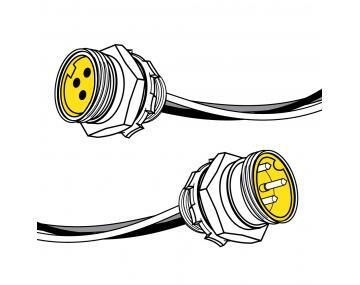 10 AWG & 12 AWG Quick-Connect™ 3 and 4 pole receptacles are available in female with 4 foot pigtails and male with 1 foot pigtails. O-Ring and locknut included; closure caps with chain are sold separately. CORDSETS MADE WITH SUPER-TREX® ULTRA-GARD™ PORTABLE CORD, RATED 90°C — Provides the best defense against tearing, abrasion, impact, oil, ozone and most chemicals. Flame and heat resistant. Extreme all-weather flexibility. MULTIPLE CONFIGURATIONS — Available in numerous lengths and configurations. PLUG BODY IS DESIGNED WITH SUPER-TREX® TSE COMPOUND — Provides superior resistance to oil, ozone and most chemicals. Flame and heat resistant. Extreme all-weather flexibility. HEAVY GAUGE BRASS SLEEVES AND CONTACT PINS — Provides superior long life electrical contact. Ensures electrical continuity through repeated disconnects. STRANDED, TINNED COPPER PIGTAILS INSULATED WITH 125°C CROSS LINKED POLYETHYLENE — Provides excellent oil and heat resistance. Available in various lengths.